Go forward in time to February 2007. 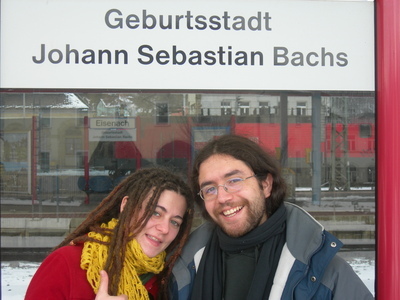 On Friday, I traveled to Talca and gave a talk about the student' life in Dresden for the candidates to the DAAD scholarship for 2007-2008, willing to travel during one year to Germany. It was nice to see how excited they are with all the scholarship thing, and to remember when two years ago, I was attending the same intensive German course they are attending now, with the same anxiety, excitement, curiosity, doubts, and dreams. I took the chance and stayed with my mom during the whole weekend. I slept a lot, watched a couple of movies in my queue, and hacked a bit. It was a pretty relaxed weekend, after all. January was pretty busy. I had long days at work with many interesting things to hack on while learning many new stuffs, and in the nights, increasingly active hacking on EOG. During some weeks I had an average of 4 or 5 hours/a day of sleeping, which is not the same as sleeping four hours a day when you are in college, where you can skip useless lectures and play with your schedule as much as you want. But so it's life. I hope to organize better my priorities in February and to sleep a bit more. Moisés, one of my housemates during the last four years in Curicó,	and one of the best friends I've had during the time I've been studying in the Facultad, defended his thesis today, and is finally now an Ingeniero Civil en Computación! Yay! We weren't only mates and friends, but I also had the honour of working on many assignments and projects with him, and it was always a pleasure. Being such a smart, creative, and hard worker person, am sure he'll kick asses now in his professional life, even more than he did in college. Funny, I closed the GNOME Bugzilla's bug #400000. What a pleasure. Last week was full of Jazz in Santiago. I went to the two first days of the Festival de Jazz de Providencia, which this year counted with a sublime show by Al Di Meola. This great musician introduced his latest album Consequence of Chaos, an album I am currently loving. An excellent opening for the festival, and I think I'll never ever see again such a great musician playing for less than CLP$ 1.500 (approx. 2 €). Thursday, Contracuarteto, with the always nice to hear Lecaros brothers, and an Argentinian band. Nice show. On Friday, I went to the Noche de Jazz en Ñuñoa, where a Big Band from the UC played many jazz classics, and Cristian Cuturrufo y Quinteto closed the night with his amazing playing. It's a shame that this year the closing night of Providencia's Festival was the same day than the Special in Ñuñoa. Hard to choose where to go, and am sure a lot of people would have loved to be in both places at the same time, if possible. Today I got a lovely package from Dresden, sent to me by my good friend Marie. After some months lost somewhere between Germany and Chile, it finally arrived bringing me a piece of the lovely Dresden. 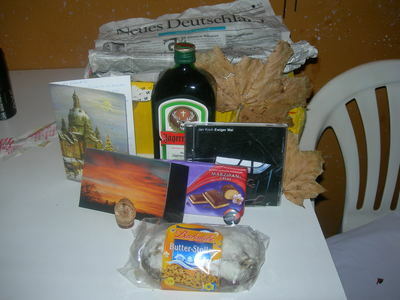 Jägermeister, a genuine Milka chocolate, a piece of Butter-Stollen, some dry Dresdner autumn leaves, a CD by Jan Koch, and many other small but lovely things. I only needed to open the package to remember the beauty of the year I lived in Dresden, and how important Marie's friendship was since the first time I met her. I miss her so much. Last Saturday, Andrés, Cristian, and a bunch of new friends met and went to the Cumbre del Rock Chileno, a huge pop-rock festival held on the Estadio Nacional, in Santiago. When I say huge, I mean huge. More than 35 Chilean bands played during approx. 8 hours, in an incredible party devoted to our most popular bands. The festival was pretty cool, even when I disliked a lot the sound engineering. Many bands didn't sound as good as they use to, but I think the organizers didn't want to spend too much money in cool amplification. Also, during the first hours of the festival, many guys were trying to pass from the cheapest accommodations place to the stadium's field, where you could have a much better view of the bands. In these attempts, a lot of people was smashed against the fences and were forced by the security people and policemen to stay back, at any cost. I am sure many of them were injured, and I have hard times trying to understand why they did it, in the first place. The difference on the ticket price between the cheapest ones and the ones for the field, was less than 5 bucks. A friend of mine (which wasn't attending with me) got his hand injured and needed to be fixed by the Red Cross people assisting the event. Does it worth the five bucks? I strongly doubt it. I didn't buy field tickets only because I wanted to be able to sit from time to time -- if I would have wanted to be in the field, closer to the bands, I rather had payed the five more bucks than seen myself into a chaotic fight with the cops, smashed by several dozens of people behind me, where anyone could have been even killed. Nevertheless, we all had a great time and enjoyed the bands a lot. I loved the presentation by Los Jaivas, which included one of my favorite songs of the band, La Poderosa Muerte. I never expected them to play it, because it's a complex song, not easy to get, and probably not the most appropriate for a popular festival. But they did it. And everyone listened it, enjoyed it, and loved it. I would have loved to see bands like Los Miserables, Los Mox, and of course Congreso playing longer. They really deserved it. On the other hand, I missed bands like Weichafe and Alejandro Silva Power Cuarteto, which represent some of the best rock bands in Chile. Hopefully, next year we'll have this festival again. I introduce you, courtesy of Trond Danielsen, the new and shiny Eye of GNOME website! After many years counting with a pretty ugly and outdated site, Trond appeared and used his skills to contribute with something we were really needing. Thanks Trond! Finally committed to the trunk and eog-ng branch the new printing UI for the Eye of GNOME. Hope to get a lot of testing and feedback before the next stable release. I got many responses to my last post about overwriting by means of mv. Everyone seems to agree that mv doesn't modify the old file itself, but the directory containing it. If you own the directory, then you won't have problems to mv on top of a file or rm it. cp, on the other hand, needs permissions on the old file to first unlink it and then create the new one. Syndicating my feed in advogato was a great idea. Does anyone have a clue of why this happens? Happy New Year! ¡Feliz Año Nuevo! Frohes Neues Jahr! Boldog új évet! Go backwards in time to December 2006.